We have just had a 5kW system installed by the Evolution Solar team. The service was fantastic from the first minute Mickey turned up at our house to the final installation by Evolution Solars own team – Dene and Peter. They took the time to discuss our options to ensure we had the system which was best suited to us. The team arrived when promised, kept us informed during the process and the follow up has been amazing. If only all tradies were half as good as Team Evolution Solar, life would be a lot smoother! Thanks Team. After extensive research we settled on Evolution Solar Sunshine Coast to install our solar system. Mickey spent over an hour explaining the various options available, which made our final system choice easy. The install was prompt and efficient and all we needed was the supplier to connect us to the grid. However, when Cyclone Marcia left us with leaks in the roof, I rang Mickey to see if they could offer any help. Within 24 hours Dene, the installer, had located the problem, which was unrelated to his installation work and fixed it, much to my relief. So would I recommend Evolution Solar? You bet I would, as they go above and beyond the call of duty. Thank you for your very professional and informative approach to our recent solar installation quote and purchase. Your installation team of Dene and Peter were on time, efficient and very good at informing me as to the progress of the work. The constant stream of information from yourself and your team certainly made the whole process easy for me and gave me a lot of confidence. Thanks to you and the team at Evolution Solar Sunshine Coast for your very professional and courteous approach to our requirements for solar power in our new home. We will continue to recommend your solar company to friends . I would like to thank Evolution Solar Sunshine Coast for their excellent service. Mickey & Dene are very professional in the way that they quote and they install AND their after sale service was exceptional. The whole operation was very smooth and they were extremely helpful with my many questions and giving information. I was impressed with the print out of all the details of what to expect and what to do after the installation occurred. I did like dealing with a family run business. We were getting very confused when we first did our research to decide which solar supplier to go with. From our first phone call to Evolution Solar Sunshine Coast we had a meeting with Mickey to discuss our requirements. We initially thought that we would need a 5 KW solar system however, Mickey explained that a 3 KW solar system was perfectly adequate for us and not to waste our money. He explained very clearly the best ways to maximise our systems output. A big part of our decision to go with Evolution Solar Sunshine Coast was that we both felt that this was a local solar company that we could trust and Mickey certainly did not pressure us in any way. The installation was done 3 weeks after acceptance and went like clockwork. Evolution Solar Sunshine Coast have their own solar installation team – Dene and Peter went to great trouble to make sure the orientation of the solar panels would give us the most efficient result. We are completely satisfied with our dealings with your company and have already, and will continue recommending you to friends and neighbours. Evolution Solar Sunshine Coast was only one of two companies that offered to come to our property to review our needs out of the six quotes that I obtained and were the only solar company that really understood and offered a system that was best suited for our needs. Evolution Solar Sunshine Coast are very efficient and their communication was very good prior to the installation. The solar installation team was knowledgeable and very polite, they measured up and then offered the best layouts for the solar panels to meet our needs and also discussed alternative solutions with any advantages / disadvantages. The installation itself took less than a day for a 6.5kW system (split on two roofs) and was very neat. We have further recommended Evolution Solar Sunshine Coast to our Friends. I would like to express our appreciation of the way in which the Evolution Solar Sunshine Coast team of Dene and Peter went about their work on this particular occasion. They arrived on time and immediately started their work in such a way that it was so noticeable that each knew exactly what to do and how to do it. Dene, who did the outside work, made it look so easy. All was carefully placed and precisely fitted. Peter, the electrician, was the perfect example of a tradesman. His work was so beautifully organized, (he even bought his own table and laid out his tools and fittings in our garage – remarkable efficiency.) It was obvious that no corners were to be cut. Cover sheets were used wherever necessary, and there was no damage or dirty marks. When they finished, all the mess was cleaned up and the rubbish taken away. Full marks to these two particular guys – I wish all tradesmen were alike. Thank you Evolution Solar Sunshine Coast! I’m sure the solar system will work as well as it was installed. We had put off getting solar installed over the last few years because we hadn’t found anyone that we completely trusted to give us the right information. With all the data out there it was just too confusing – until we meet Mickey Harris from Evolution Solar Sunshine Coast. From our first meeting with him we decided that we had finally found the right business to deal with, Mickey’s integrity won us over. We have been extremely impressed with the professional standard of the Evolution Solar Sunshine Coast team from the start through to the installation and after service care. We were thrilled to receive our first 3 month electricity bill showing a large credit. Due to Mickey’s initial assessment of the system we needed and the options we were given we know we have installed the right system for us. After consultation with Mickey, the decision to go with Evolution Solar Sunshine Coast was an easy one. Mickey answered all of my questions with great patience. Another plus in my opinion was the fact that he was the owner of the company and had is own installation team. From the first contact to the final install, all went as promised. One year on and I am really pleased with the performance and have no hesitation in recommending their solar company. Not only do we no longer pay an electricity bill, we receive a substantial credit from the utility company. 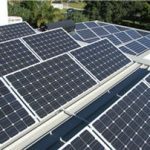 When we decided to purchase a solar power system, we consulted several solar power companies before deciding to choose Evolution Solar Sunshine Coast. We chose Evolution Solar Sunshine Coast because they were prepared to patiently spend time discussing, researching and identifying the most suitable system to meet our requirements. It was recommended that we should install a system which could easily be upgraded by adding more panels at a later date without changing the initial inverter. The initial phase, consisting of a 1.52kW system with 8 x 190W panels, was installed in May 2011. The system has been very successful and resulted in us being in credit from the time the system was installed. In view of the fact that electricity prices will inevitably rise, we decided to upgrade and add the second phase, which involved adding another eight panels. This upgrade was carried out efficiently, on time and with the minimum of fuss. As this point in time the results are very positive and well and truly exceeding our expectations. At Evolution Solar Sunshine Coast we have been most impressed with everyone with whom we have dealt. Each one of them has been pleasant, helpful and knowledgeable. All work has been carried out skillfully and efficiently. We have no hesitation in recommending Evolution Solar Sunshine Coast. Seeing is believing. I just received my first power bill since fitting solar power on the Sunshine Coast. I couldn’t believe my eyes. I did receive quotes from other installers but when it came to making a decision, Evolution Solar Sunshine Coast was my choice. Evolution Solar had quality as well as great project knowledge. The service I received from Mickey and his team at Evolution Solar Sunshine Coast was excellent. I would recommend Evolution Solar to anyone who was thinking of getting solar. Give them a call and you won’t be sorry. When we decided to invest in a solar electricity system for our Sunshine Coast home, we were very careful in our selection of the right company. I guess we were all too aware of the problems which arose through the failed government insulation scheme and other similar projects. We needed to be convinced that the company we chose would deliver as promised. For us – Evolution Solar Sunshine Coast certainly delivered in all phases – valuation of site, recommendations, installation and after sales service. They exceeded their promised performance at all levels. We have a 3.675kW system and since installation we have received a payment cheque from our supplier – AGL – for each of the last three quarters. So – not only are we effectively getting our power free – but we also get a quarterly cash ‘bonus.’ Our home has multiple split air conditioners, a swimming pool etc. I have no hesitation in saying that Evolution Solar Sunshine Coast over delivered for us with our solar power needs and we are very pleased with the benefits we will continue to enjoy for years to come!